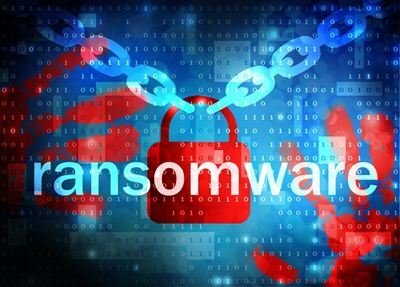 Ransomware would cause a big trouble to computer users, and backup computer should be the best defense against ransomware such as WannaCry. Ransomware is malware designed to hold data hostage on a device and then demand a ransome to decrypt or recover files. Ransomware can occur in multiple forms. It bursts in your computer and points a gun at your data, and screams for cash. If you do not know how to defense against Ransomware, you may get into a big trouble. WannaCry or Wanna Decryptor is such a Ransomware that could happen again and again if you don’t learn to defend yourself. It is a kind of strong newly warm virus that spread by taking use of the hacker’s weapon EnternalBlue, which can long-ranged attack Windows port 445, and the files on the disk will be encrypted without no operation, so that hacker can long-ranged control computer, and ransome Bitcoin from users. Once it bursts in your computer, your folders will be encrypted with the file extension “.WNCRY”, and the wallpaper will be tampered, the desktop will pop up a window with the content: Make a payment [typically several hundred dollars, sometimes thousands] in Bitcoin to this online account, and you will receive the decryption key to recover your files. Refuse to pay, and your files will remain encrypted or even be deleted. Ransomware makes a heavy influence to people. It can easily attack government services website, hospital, bank, gas station, etc, and ransome people for Bitcoin. Many places have to stop their business. Even worse, Ransomware may bursts in campus LAN, many graduates’s paper would be encrypted. Without backup, they can only re-write paper, and many of them may get into the danger of graduate. The Ransomware may hide in some malicious software. Once you download those software, you may launch the attack and the files will be encrypted. And those malicious software may be installed on a victim’s device is through phishing emails, malicious adverts on websites, and questionable apps and programs. Thus, you need to pay special attention to the emails, websites, and never download an app that hasn’t been verified by an official store. If you cannot distinguish the malicious websites or apps, you can use an antivirus program. Originally, most antivirus programs can scan files to see if they might contains ransomware before downloading them, and they can scan whether the website is danger when you browsing the web. It is necessary to always install updates of your software because the companies often release software update to fix vulnerabilities that can be exploited to install Ransomware. Microsoft advocated that WnnaCry Ransomware won’t affect on Windows 10. So, upgrade OS to Windows 10 should be an effective way to protect computer from Ransomware. Otherwise, you need to install the patch as soon as possible. 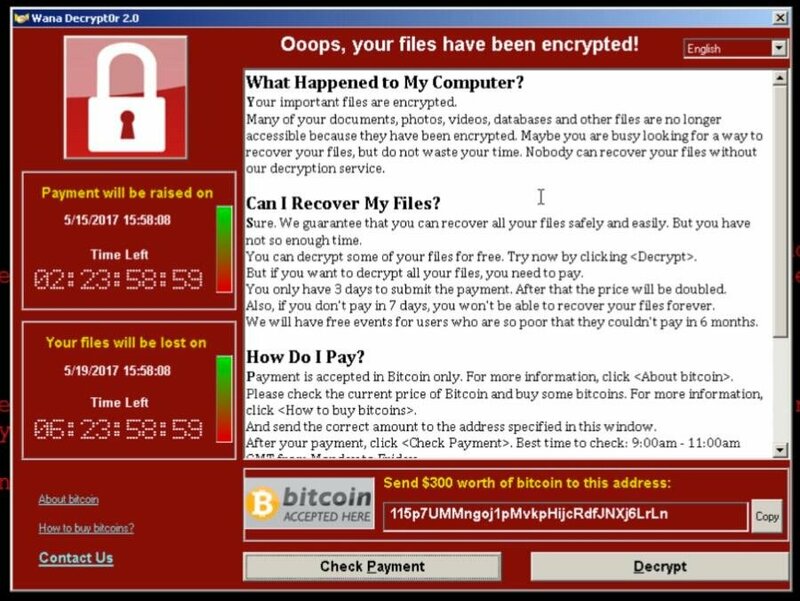 The WannaCry Ransomware spread with Windows port 445. Thus, it is necessary to shut off Windows port 445. Many victims of ransomware may pay the ransom for decrypting the files. But the truth is, if you pay the ransom, they may ask for more. You will lose your money but not solve the problem. Thus, the best defense against Ransomware should be backup files. If you have a back up, you can restore your device from that. If your computer has already burst by Ransomware, the only thing you can do is to re-install OS to release the Ransomware. But doing that, your important data cannot be recovered directly. However, if you backed up your computer before Ransomware invasion, you can restore computer to earlier date in case of re-installing OS. Thus, backup data should be the best defense against Ransomware. To prevent computer from Ransomware, you’d better backup computer to an external hard drive. So, before you do, prepare an external hard drive to store the backup images. Step1. Connect the external hard drive to your computer, make sure it can be detected by your computer. Download AOMEI Backupper Free, install and launch it. You will see its concise interface. ClickBackup, and choose File Backup. Step2. Click “Step1”, select the files/folders on the computer as the source party. Then, click “Step2” to select the external hard drive you prepared before as the destination disk. Step3. 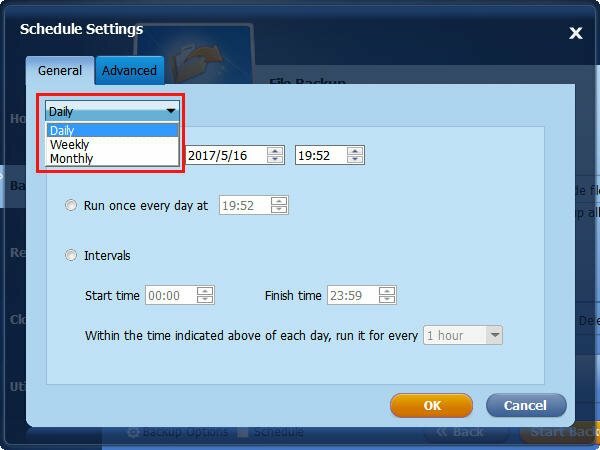 Before clicking Start Backup, you can set up an automatic backup in Schedule option, so that you won't miss any changed files. Finally, you can click Start Backup to submit the operations. When the progress reaches 100%, you have already backed up your important files. Disconnect the external hard drive. 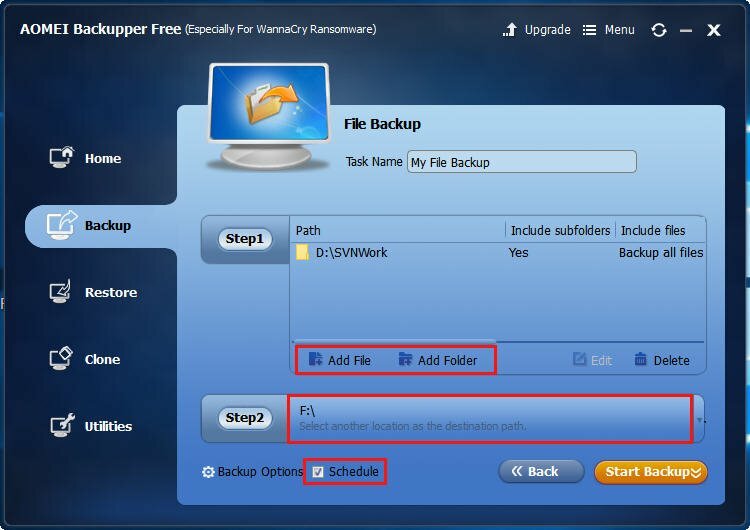 With this backup image, you do not need to afraid of WannaCry Ransomware, because you can restore data from the backup image once your computer documents has been encrypted by the WannaCry Ransomware. It should be the best defense against Ransomware. 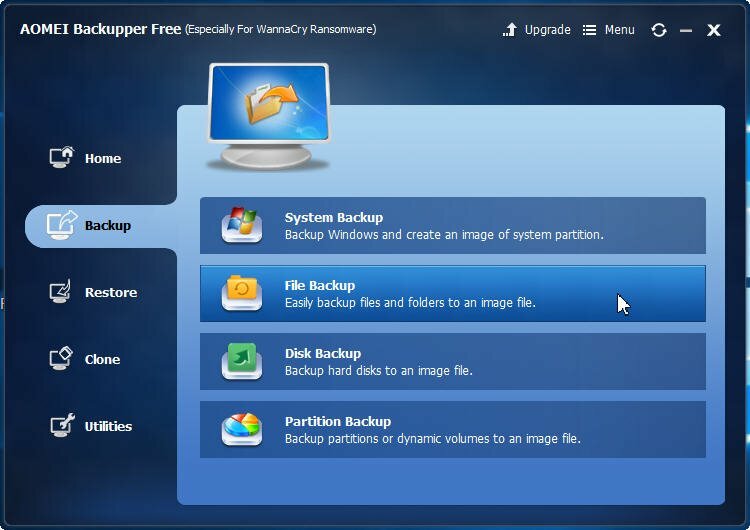 Backup data should be the best defense against Ramsomware, and it is a good habit for protect data safe. If every user has the good habit of backup data, then, when Ransomware comes, you can use the back up to restore computer to earlier date, and it won't be a threaten anymore.